Doctor Strange has lost his connection to Earth’s magic, but lucky for him, there’s an entire universe out there brimming with mystical power waiting for him to tap into it. 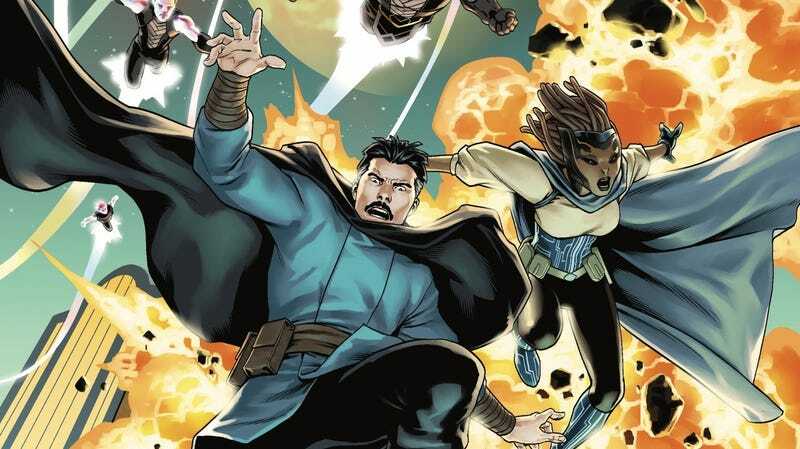 This concept has allowed writer Mark Waid and artist Jesús Saiz to take Stephen Strange outside of his comfort zone by sending him to space, where he’s made a new friend—and whole lot of new enemies—as he regains his magic skills. The relaunched Doctor Strange series has been a very effective new direction for the Sorcerer Supreme, exploring the complexities of Stephen’s character while putting him in the middle of a thrilling cosmic adventure. The story gains extra depth thanks to omniscient narration that allows Waid to delve deeper into Strange’s emotions while giving readers more context on the alien worlds he’s visiting with his new companion, the arcanologist Kanna. Doctor Strange has turned into a tour of Marvel’s cosmic corner, first by introducing a new alien planet called Grynda, then continuing with Stephen and Kanna facing off against the Skrulls and gaining an Infinity Stone in the process. This exclusive preview of next week’s Doctor Strange #4 has the pair facing off against Majesdanians, the alien race that Runaways’ Karolina Dean descends from, and it showcases how well Waid and Saiz keep the momentum of the story going while compressing a lot of information on the page. Saiz has always been a strong storyteller, but his art has reached new heights ever since he started coloring himself. He has an exceptional understanding of different textures, which adds a tactile quality to his linework that makes everything feel more grounded and real, even when the characters and environments are overtly fantastic. He’s made Doctor Strange a gorgeous series, matching the richness of Waid’s writing with his lush artwork.